Summers in Cleveland are legendary. The Land has hundreds if not thousands of events, attractions and venues that residents attend in droves every year. Many of our best memories include summer days and nights in Cleveland. Going downtown to watch the fireworks on Independence Day, eating mouth watering Barbecue at various rib burn offs, county fairs and festivals. Hanging out with family and friends at the backyard cookout. Going to Edgewater Park to swim or just enjoy the sun and scenery. Summertime in Cleveland is a beautiful thing. One major constant in all of these scenarios is ice cream. As a child, going to the ice cream truck was a treat and many great summer days were capped off with a trip to the ice cream parlor for sundaes, milkshakes, root beer floats and waffle cones stuffed with delicious ice cream (frozen yogurt if your parents were health conscious). My late grandmother’s favorite dessert was a vanilla cone from McDonald’s served upside down in a cup. Every year on her birthday we all grab some and take selfies with our cones to celebrate her life. Cleveland has plenty of place to grab ice cream. Some places are seasonal while other ice cream parlors are open year round. Abby and I have done extensive research and have been able to compile this glorious list of Best Ice Cream in Cleveland. Some of these places you will be able to recognize and others may be new to you. If you are a vegan, many of the top spots have vegan ice cream for you. In addition, quite a few establishments use local sources for their ingredients and high quality organics in their ice cream, yogurt and sorbet. Either way, all of these establishments can help you soothe that sweet tooth and create memories and traditions of your own. An eastside suburban institution, Dairy King has been one of the most popular ice cream stands in Cleveland for many years. A good friend of mine told me that they would drive from North Royalton to Dairy King in South Euclid because of how good their sundaes are. She grew up in Lyndhurst and her family would go all the time. She loves the Earthquakes and ice cream cones dipped in a blue raspberry candy shell. My favorite there is the Super Strawberry Shortcake Sundae. They are open from spring to fall every year so if you find yourself on Mayfield Rd and stuck in traffic, it is probably summer and fans are trying to grab some ice cream from Dairy King before they close. 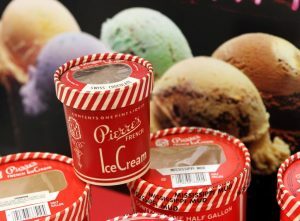 Mitchell’s Ice Cream has fast become a top destination for ice cream enthusiasts in Cleveland over the last few years. In addition to having tasty ice cream, Mitchell’s makes it a priority to be socially responsible in obtaining its ingredients from local sources and fair trade organic many of its international sources. 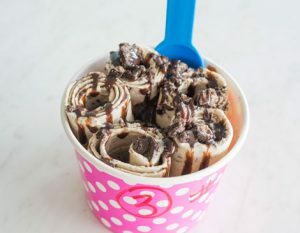 All of the ice cream is homemade in its Ohio City location and they have many healthy options for its customers including vegan ice cream(which is very good). When I stopped by with Abby, we enjoyed the Wildberry Crumble and the Amaretto Cookie. The kids loved the Blue Cosmo, Mango Sorbet and the Lemon Black Raspberry Yogurt. With several Cleveland Area locations, Mitchell’s is something you have to experience for yourself to believe. A true American success story, Honey Hut Ice Cream is the result of the hard work of Frank and Marianne Page. When they first opened in 1974, Frank was a Cleveland firefighter who tested many of their flavors on the guys in at the firehouse. Their signature flavor “Honey Pecan” set off the growth that has resulted in 5 locations spread throughout the Greater Cleveland Area. Recently voted Cleveland’s Favorite Ice Cream by readers of The Plain Dealer, Honey Hut has a lot to be proud of. Another unorthodox fusion, coffee and ice cream. Where else but Lakewood? Ice Cream Joy combines these two staples for a unique experience that merges hot and cold, yin and yang, good and evil, etc and what you end up with is a utopia of diversity of flavors, textures and tempurates. Ice Cream Joy has a seemingly endless list of ice cream flavors. When I saw all of the flavors, I immediately thought Charlie and the Chocolate Factory…on 10 red bulls. Combinations like Amaretto Sugar Cookie, Bourbon Caramel Pumpkin Pie, Pixie Dust and Watermelon Balsamic Feta ice cream may spark a mental breakdown. That being said, I just went with the Super Chocolate Strawberry Ice cream and the iced coffee. I think they have vegan flavors because it is a Lakewood requirement(just joking) but flavors like Coconut Cream Lemongrass, Creamy Watermelon and Vegan Maple Bacon makes picking a cone harder than negotiating a Lebron James deal. Throw in the fact that they work with local sources for their ingredients, and you have a model company that I am happy to patronize. Many years ago, I met with a franchise owner of a Dairy Queen in Columbus, OH for an advertising job I had. He gave us a tour of his place and told us that he used to work in the same Dairy Queen when he was a kid. He also showed us how all of the ice cream machines worked, food preparation and gave us samples of everything on the menu. That experienced showed me the dedication that he and many other Dairy Queen franchisees have in their business and reignited my love for “DQ”. I love the Blizzards, Dilly Bars and strawberry sundaes in addition to the chicken strip baskets. A rite of passage in Cleveland is for you to have one of their frozen birthday cakes served at your party. Even today, I love to take my children in for a blizzard as a reward for good grades.